England defender Laura Bassett says winning the SheBelieves Cup is "really significant" for Phil Neville's side as they prepare for this summer's World Cup in France. The Lionesses comfortably beat Japan 3-0 in their final round-robin match to lift the trophy for the first time. They also beat Brazil and drew with reigning world champions USA in the invitational competition. "It definitely means a lot to win a tournament," Bassett told BBC Sport. "It's about gaining momentum and confidence going into the next four friendlies before the World Cup. There's been some outstanding team performances as well as individuals." Neville made eight changes to the starting line-up for the final match against Japan and said he wanted to give players an opportunity to show what they can do before he names his squad for France. Former Arsenal, Chelsea and Birmingham defender Bassett, 35, says the manager "really tested the players' characters" in America and urged him to "get the balance right" in his World Cup squad. "He almost needs to put each player under stress and see their make-up and see if he wants to take them to France," said Bassett, who has won 61 caps for England. "I'm sure he would have learned lots of lessons. "If you're going to play at a World Cup you have to learn how to thrive." 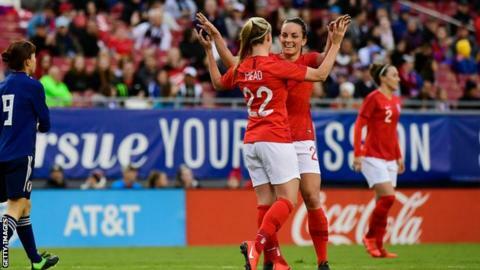 England have a strong chance of succeeding at the World Cup as they go into the tournament ranked fourth in the world and Bassett - who has played in two World Cups and three European Championships - thinks reigning champions the USA showed weaknesses at the SheBelieves Cup. "This is the first World Cup where you've got real underdogs competing. You've got six or seven of the top nations who could realistically win it," said Bassett, who gave birth to a daughter in December. "The USA are going through a transition and their depth is probably better than ever, but with that there's more decisions to make in terms of formations and picking players. Sometimes it's hard to put that jigsaw together. "I think the more England play these top nations, and they break down barriers and perceptions, they prove that the USA aren't as big as they used to be."